From the Horse’s Mouth. The New Study on Cosmic Rays and Climate. Here’s the Nature podcast interview with Jasper Kirkby, author of the new study that has denialists all atwitter (again) over cosmic rays. Briefly, the theory is that cosmic rays hit the atmosphere, and when colliding with gas molecules create tiny cloud seeding particles, (“cloud condensation nuclei”) and thus, so the theory goes, could increase cloud cover. Low clouds, in particular, reflect sunlight, and exert a cooling influence. Therefore, so the theory goes, when the sun is in an active state, solar magnetic fields are strong, shielding the earth from cosmic rays, not as many clouds form, making it warmer – even warmer than it would be from the more active sun. Voila. 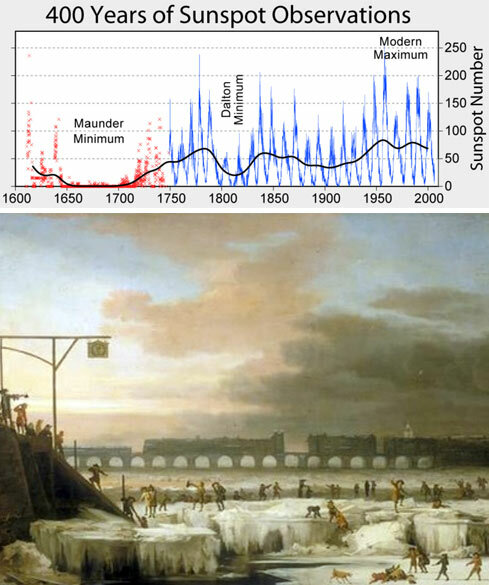 The Little Ice Age. Recently, experiments were undertaken by Dr. Kirkby (interviewed above) at the European Atom smasher facility, – CERN – to learn more about the particle interactions that might validate this theory. The publication of his recent paper on the results has been bouncing around in the denialosphere as yet another “final nail in the coffin of man-caused global warming”. Dr. Kirkby’s take, as you hear in the interview — not so much. Even with the large enhancements in rate caused by ammonia and ions, they conclude that atmospheric concentrations of ammonia and sulphuric acid are insufficient to account for observed boundary layer nucleation. There are more questions to answer. 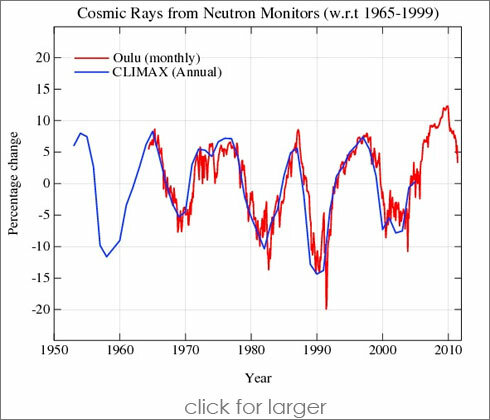 If cosmic rays have an effect on climate, we should expect that, given the unequivocal warming of the last 40 years, there should be a corresponding trend in cosmic rays. And we don’t see one. Moreover, solar experts tell us, the sun has been in an extended minimum for several years now. lower temps for the last few years, and more cooling to come. There’s a problem with this idea. We are not observing such a cooling. That’s the cliff notes version, as simple as I can make it – I hope not ridiculously distorted. For those that need it – here’s more reading. Skeptical Science Is the Sun causing global warming? More Skeptical Science Can Cosmic Rays Cause Climate Change? Nick, you are correct that water has its highest density at about 4C, but the density differences at temperatures near 4C are tiny. The density difference between water at 1C and 4C is less than 1/100-th of 1%. The density difference between water at 3C and 4C is less than 1/1000-th of 1%. Moreover, the density of surface water has absolutely no effect at all on coastal sea levels, because the surface layer of the ocean is floating on the lower layers, and if its density goes down then it rises up in place, like an iceberg, with no change in displacement. No, Nick. The “leverage” works the other way. The effect of changes in water density in the deep ocean are spread out over the larger surface area, which means it has a smaller effect on coastal sea levels. Moreover, it takes hundreds of years for surface heat to reach the ocean depths, so the hypothetical CO2-driven surface temperature increases cannot have had significantly affected deep ocean temperatures. Moreover, the Argo buoys aren’t finding warming in the deep ocean, anyhow. It’ll never happen. The deep ocean water is in the 2-4 C range, and there’s no evidence of any warming, and the 20th century’s warming will not have any effect on deep ocean water temperature for hundreds of years. The not-so-tricky trick is explained here. Continued harping on this non-story is only possible for those in denial of the facts. Many press reports confused the meaning of “hide the decline.” Mike’s nature trick wasn’t to hide a decline in temperatures, it was to hide the decline in proxy-generated temperature extrapolations which embarrassingly coincided with an increase in measured temperatures, proving that the proxy-based method for determining ancient temperatures does not work. You didn’t make that mistake, but you made others. It is only a “non-story” to you because you don’t understand it. In your discussion of Mike’s original Nature Trick, you seem unaware of that. To see Jones’ fraud, look at the actual graph discussed in his email (google for: “WMO STATEMENT ON THE STATUS OF THE GLOBAL CLIMATE IN 1999” and look at the first page). In that graph, there was no indication given that real temperature data had been merged with proxy data for the recent years. There also was no indication given that the proxies and real temperature data diverge in the later 20th century, and no mention of the resulting implication that the earlier temperatures (deduced from proxies by the falsified method) are also highly dubious. It was, in other words, designed to deceive. But that is not known to be true. You’ve stated as fact what is actually mere speculation. The agreement between the proxies and actual ancient temperatures is very much in doubt, because we don’t have reliable measured temperature data prior to the 20th century. The only clear agreement between the proxies and actual, measured temperatures is for a period of time barely longer than the length of the smoothing filter used! The whole purpose of the proxies is to try to deduce what the ancient temperatures were, and the (trickily hidden!) divergence between proxies and actual temperatures falsifies the method. It proves that the method doesn’t work, which means we don’t know what the ancient temperatures were. “Mike’s Nature Trick,” to which Jones admitted in his damning email, was fraud, pure and simple. Greenhouse gases are trapping heat. Heat makes things warmer. That warming has been predicted for a century. Global Temps ARE rising, the graph shows that, subsequent research has born it out, and as the Academy sensibly noted, we are concurrently observing planetary effects unprecedented in millenia. or those with an autistic fixation on diversions and minutia. No, Peter, the “hockey stick” has been discredited (by, among other things, the historical record of the MWP, which it tried to erase). Greenhouse gases do, indeed, trap heat, but the incremental addition of CO2 to the current atmosphere has only a very small direct warming effect, and the best evidence is that the large multipliers of that effect which the IPCC-favored models predict are very drastically exaggerated. Your claim that global temps are rising is false. Global temps rose in the later 20th century, but have plateaued since then. It remains to be seen whether they’ll resume rising, begin falling, or remain relatively stable. In the meantime, there’s nothing unprecedented about current temperatures, or the fluctuations in them that we saw in the 20th century. The fact is that Jones’ use of “Mike’s Nature Trick” to hide the divergence between proxies and actual temperatures was fraud, with huge implications for both science and public policy. Additionally, about 3/4 century of rising atmospheric CO2 — up 24% since 1958 — has resulted in no increase at all in the rate of sea level rise, a fact which is proven unambiguously by actual measurements of sea level at many locations around the world over that entire period of time. simply repeating something does not make it so. Sorry, we deal in realities here. there is no temp data set that does not show warming. You have constructed an elaborately detailed dreamworld. Reality, eh? Do you really care about it at all? To deny reality is not “dealing in” it. Dismissing fraud as “fulminating over distinctions that make no difference” is refusing to deal with reality. W/r/t temperatures, you can show the appearance of warming if you choose your starting point and/or averaging period with the intent to do so. For instance, we’re frequently told by the AGW alarmists that the first decade of the 21st century was the warmest decade on record. That’s true, but it’s also a clever way of camouflaging the fact that temperatures ceased rising over a decade ago. There’s been some fluctuation since then, but no sustained increase. Temperatures have plateaued at fairly warm level. But, though the earth is quite warm, it doesn’t seem to be getting any warmer. It’s warmer now than it was in 1988, but not warmer than it was in 1998. So, is it getting warmer, or not? One can make a defensible argument either way. Sea levels, OTOH, have no such ambiguity about them. The evidence is overwhelming: the rate or SLR is not increasing. So, if you care about “reality,” how about admitting, for a start, the single most important fact that everyone should know about sea levels: that well over half a century of steadily climbing atmospheric CO2 levels have produced no increase in rate of sea level rise at all. Your other points are similarly skewed by an ideological bent. Sorry, I use this blog to translate what the leading experts are telling us, not to second guess them, or make up stuff on my own. …with an example illustrating it. Note the plateau in the global average lower tropospheric temperatures and the slight declining trend in global sea surface temperatures, since the 1998 El Nino peak. John Christy was quoted a couple of years ago saying, “The evidence we are building here shows there is a warming trend over the past 30 years. It is certainly plausible that C02 is a factor. But we have lots of evidence that other things contribute.” Which is right. Christy and Spencer, most famous for being wrong. BTW, did you notice that a Nobel prize-winning physicist just quit the APS in protest of its unscientific, politically-driven promotion of AGW alarmism? “Nothing to do with climate?” Did you even bother to view the video that Green Man Peter posted, before you replied, D&S? Dr. Kirkby said that the whole point of his research is to determine the effect of cosmic rays on clouds and climate. Clouds and climate were mentioned, by my count, 28 times in that short interview. But you claim he says his work has nothing to do with climate?? He actually said exactly the opposite. This needs to be updated with the latest findings.